November 11, 2011 marked Stanbridge College’s 23rd Commencement Exercise for the Vocational Nursing and IT Fall Class of 2011. Stanbridge College is pleased to announce the graduation of 125 Vocational Nursing and Information Technology students in the Class of 2011. November 11, 2011 marked Stanbridge College’s 23rd Commencement Exercise. The Fall 2011 Commencement also celebrated the inaugural class of graduates who earned their Associate of Science in Information Technology. Guest speaker Orange County District Attorney Tony Rackauckas provided the graduates with words of gratitude and congratulations. “When I look at this graduating class, there is no doubt in my mind that you are going to bring credit to Stanbridge College and most importantly, to yourselves,” stated Mr. Rackauckas. “Our graduates assembled today are the embodiments of an unyielding commitment to success,” stated Yasith Weerasuriya, President of Stanbridge College. Mr. Weerasuriya went on to praise the graduates for their sacrifices in balancing their education with their professional and personal lives. He also strongly advised the graduates to use critical thinking, respectful communication and compassion for their fellow man as they continue on the next educational or professional stages of their lives. Guest speaker Orange County District Attorney Tony Rackauckas provided the graduates with words of gratitude and congratulations. According to Valedictorian and Vocational Nursing Graduate Ofelia Angeles, “Many months of absorbing new [knowledge] while adhering to the high standard of learning at Stanbridge College, was a true test of our desire to become nurses. I remember when we started term 1, each of us were asked, ‘Why do you want to become a nurse?’ Regardless of our [individual] reasons, one thing is true – Our hearts directed us to fulfill our dream to become nurses because this is our passion and calling.” November 11, 2011 marked Stanbridge College’s 23rd Commencement Exercise. Stanbridge College offers on-campus and online degrees in Allied Health and Information Technology and places emphasis on industry certification preparation for its graduates’ professional careers. Stanbridge College maintains one of the highest continuous pass rates on the NCLEX-PN National Nursing Board Exam in California since 2007 with a 96% cumulative pass rate. Its IT degrees prepare students to test for a wide variety of top IT industry certifications including CompTIA and Cisco Certified Network Associate as recommended by an Advisory Board comprised of major IT employers in Southern California. Stanbridge College’s Career Services department also provides graduates with a multi-step career placement process including networking opportunities, alumni workshops, and job searching preparation. Stanbridge College also encourages its students to participate in community service. Stanbridge College’s REACH – Beyond the Classroom Service Learning and Civic Engagement initiative provides students with opportunities to give back to their local Orange County and global community while earning credit towards coursework in a structured environment. To learn more about Stanbridge College, Vocational Nursing and Information Technology programs and REACH, please visit www.stanbridge.edu. 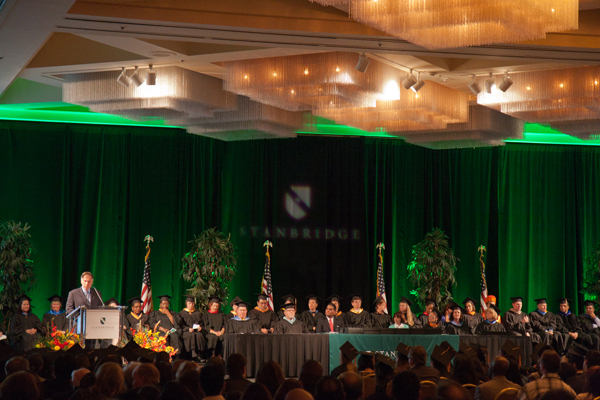 View more photos of the Fall 2011 Commencement Ceremony on the Stanbridge College Facebook.